Acknowledging the fact that participants have a wide range of professional backgrounds, core modules aim at providing the student with a general overview of different disciplines relevant to natural resources. The NRM-SEA program follows the principle of sustainable development, which can only be achieved in consideration of ethical and social aspects. Therefore, such aspects play a fundamental role during the studies. In various courses students are encouraged to think and reflect critically. The elective modules are organized into “Methods and Tools” and two thematic blocks: “Integrated Water Resources Management IWRM” and “Natural Resources Management and Development NRM”. 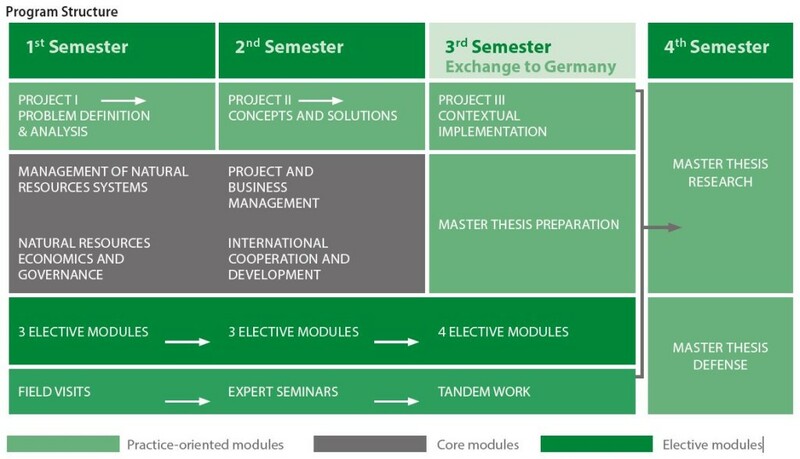 Students select a total of ten elective modules from the respective module catalogue NRM (minimum 25 ECTS), the module catalogue methods and tools (minimum of 10 ECTS), and a maximum of 15 ECTS modules from any module catalogue, including the catalogues of the adjoining master program (IWRM). Such multiple opportunities of elective courses choices are beneficial for the interdisciplinary nature of the student body. Every student is supported in his way of specializing during the master program. Since resources management includes numerous cross-cutting issues, free choice of electives from the adjoining module catalogues related to water is highly important. The fourth semester is dedicated to the master thesis research which is addressing a present research or management problem. Internships and research stays predominantly in Vietnam guarantee the practical orientation of the master research, which is preferably done in cooperation with an ongoing project of an institution or company. Here students demonstrate their ability to analyze a problem as well as design, execute and document the related research. Hence, the student applies the knowledge and competencies acquired in the previous semesters and demonstrates the ability to plan and execute a project systematically and independently.